It has been a busy few days for us with the launch of our website and then heading off to attend a CPD event for GPs. We love getting out and about and talking to Doctors, so Anna, Nicky and Emma made their way down to London last Thursday. It was an early start on Friday – at 7am we set up our stand and display with our newly branded banners, flyers and giveaways (including thermos mugs, pens, post its and USB sticks), which were all really popular. It was a busy day with GPs arriving from 8am and it wasn’t long until we had a little queue around our space and all three of us were busy chatting to Doctors about international and UK jobs. 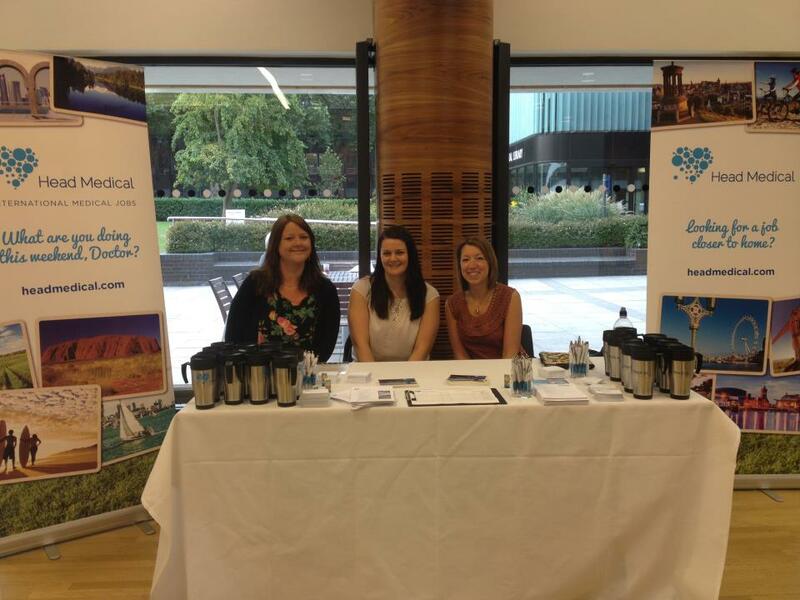 We met 750 GPs over the two days and it was great to see so much interest in working internationally and at home. Interestingly, we discovered that there are a lot of misconceptions about working in Australia and reasons people were put off (low salaries, having to sit exams, jobs in outback only, only want ‘young’ GPs or only want people with several years’ post MRCGP experience). Luckily, we were able to counter all of these and explain the simple and easy registration pathway: no need for exams, excellent earning potential and a wide range of jobs available – from capital cities to regional towns and yes, really rural, depending on what location and lifestyle people are looking for. Experience is valued, but we can help Doctors at all stages of their career – whether they’re newly qualified GPs, or are in the later stages of their careers, seeking a sea change before fully retiring. A number of people were pleasantly surprised and are now considering Australia as a serious and viable option. New Zealand with its fabulous lifestyle, great healthcare system and easy registration process was as popular as ever and it was great to also get lots of interest in the UK jobs market – with locuming in Scotland as an attractive option. We had a great time down south – the autumn sun was out and we discovered new places to eat: Asian food on Charlotte Street, fantastic eggs benedict in Momos, just around the corner from the event and exceptional Lebanese Mezze in Earls Court close to our hotel. We will be back in London next month for the BMJ Careers Fair (19-20 October) – and we can’t wait. We will also be at the RCGP Annual Primary Care Conference in Glasgow, SECC (3-5 October) next week and look forward to meeting more GPs – come and see us at stand 66.